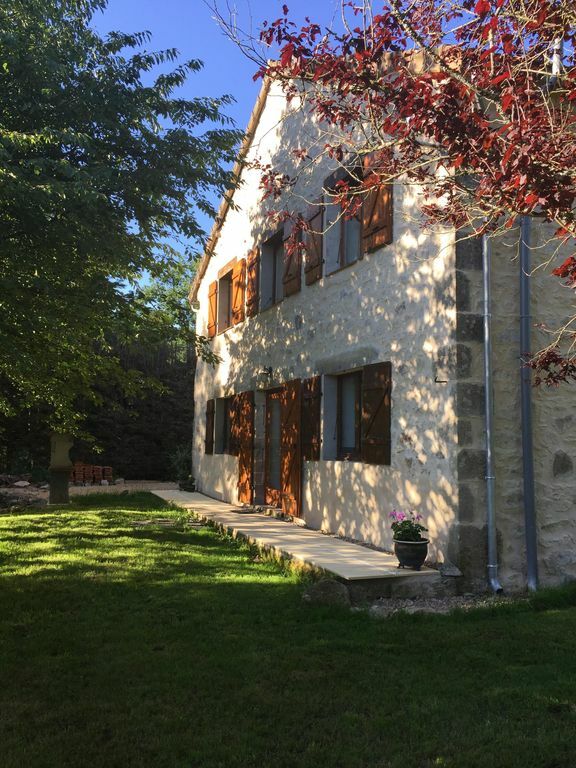 The large, 18th century traditional stone-built cottage provides a tranquil environment where you can relax into the French laid-back lifestyle but remain within easy reach of the many activities & events the region offers. With oak-beamed ceilings, natural stone & solid French oak flooring, the cottage is furnished with a mix of French vintage pieces & modern fittings & all the beds have quality, deep mattresses & 100% cotton bed linen.​ The cottage sits in a large landscaped garden with a 10m x 5m salt water pool (shared with the owner). There is a huge open plan living/dining room with a traditional wood-burning stove & plenty of comfy seating for everyone. The large fitted kitchen is well-equipped & open plan to the living room so no chef will be lonely! Upstairs, the cottage sleeps up to 6 people in 2 double bedrooms with king-size beds & one twin room with full size single beds. A full-sized cot & high chair are available on request. All the beds have deep, comfortable mattresses & 100% cotton bed linens. There is one en suite shower room & one bathroom with shower. To help you relax, UK Freeview TV & unlimited wi-fi broadband access are provided. You will be also provided with all bed linen & towels (including pool towels). Outside, there is a BBQ, dining table, chairs & umbrella. The salt water pool is open from the last week in May until the last week of September (subject to change depending on the weather) & has chairs, umbrellas & loungers available. The setting is rural but within just two minutes' walk is the neighbouring chateau with a great restaurant & lively snack bar which has live music weekly during July & August. The nearest village is just over a mile away & has a number of bars, restaurants & shops. Supermarket shopping is available just 10 minutes away.